Greensboro has experienced a 15-year slump for major construction projects, but developers are slowly returning with small projects, the city’s Growth and Development Trends report for April shows. The number of large projects has declined by 61 percent in the past five years, the Greensboro News & Record reports, citing a construction contractor who says the city’s restrictive policies have discouraged development while other communities such as Winston-Salem are thriving. Janet Mazzurco, president of Verona Marble and Tile, said she supports smart development, but the city’s tax rate and permitting processes are not as streamlined as they are in other cities and that makes it easier for companies to build elsewhere. “It’s absolutely nothing to do with the recession in my opinion,” Mazzurco said. “When you visit other cities, they are thriving. Greensboro is lagging behind. Raleigh is thriving. Charlotte is thriving. Winston-Salem is thriving. We’re eating Winston-Salem’s dust. The report says that from 2011 through 2016 developers planned 229 large-scale projects — which generally involves the construction of public infrastructure — compared with 593 in 2000-2005. During 2006-2010 those building permits also declined to 329, which reflected the end of the real-estate boom and the depth of the national recession. More recently (in the past five years) smaller site-plan approvals, which typically involve one lot or building, increased by nine percent, compared with the previous five-year period. However, 497 site plans between 2011 and 2016 is still dramatically fewer than the 661 from 2000-2005 before the recession. There’s a continued slump in commercial projects despite some growth in industrial, institutional and a small number of mixed-use projects. 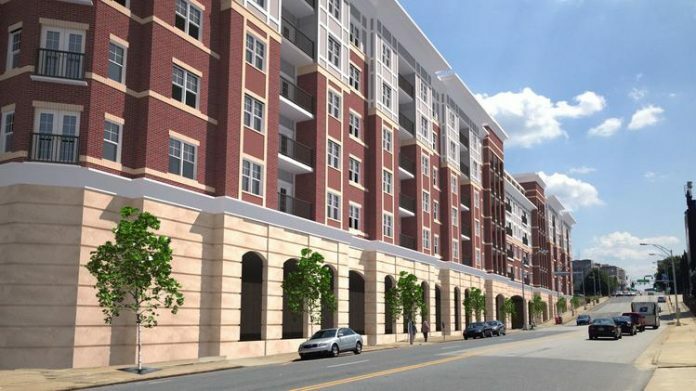 There are two major downtown projects at First National Bank Field, home of the Greensboro Grasshoppers, including developer Roy Carroll’s $70 million Carroll at Bellemeade project with a hotel and apartments. As well, a local development team plans to construct a $24 million, nine-story office building at the corner of Bellemeade and Eugene streets to be integrated into First National Bank Field. However, Mazzurco, a member of the Greensboro Zoning Commission, indicated the city could do more to encourage development. She said one small example is Trader Joe’s, a specialty grocery store that opened in Winston-Salem after considering a Greensboro location that drew neighborhood opposition. Despite an open invitation from the Greensboro City Council to take a second look, Trader Joe’s officials said in May that the city is not currently on their list of sites, the newspaper reported. I would go one step further, we as tax payers get less for our money than many lower taxed towns! Just look at the poor condition of fire hydrants, low end signage for parks and directional signs, less completion for city projects due to the way specs are written…goes on and on!